My kids eat apples like crazy, but occasionally we end up with a few left at the bottom of the fruit bowl that have seen better days. Rather than throw them away, I use them to make these delicious pastry treats. I find the ingredients for this dessert are always in my house. I keep the crescent rolls in the refrigerator since I like to have them on hand in case I get unexpected company and can throw together this. Cut each apple into 8 wedges. Open crescent rolls, place apple wedge in each one. Roll up. Place in 9 x 13 pan. Melt butter, add sugar and cinnamon. Pour ginger ale on top. I just made this . The kitchen smells fantastic. I can't wait until it cools so I can taste it. This was such an easy recipe. Thanks for sharing! Glad you enjoyed the recipe! It is always a hit in our house. I couldn't believe how good and easy it was the first time I made it. Tasted as good as it smelled! Stan and I even had it for breakfast. I'll definitely make this again. Whats the ginger ale for? 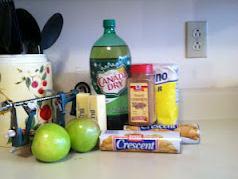 The ginger ale helps to give it a glazed appearance and taste. I have never tried doing it without, but if you do-let us know what you think. My daughter and I just made these and they are so delicious. They were so easy to make. Glad you were able to enjoy some baking time with your daughter! Enjoy!